Are you a hold out on switching to CFL bulbs? Or just need more? If you are a Duke Energy customer like I am (if not, keep reading), you can get FREE CFL light bulbs! I took advantage of Duke Energy giving away these newer CFL light bulbs that are instant on and don't flicker like the old ones. I received a dozen CFL lights free and they arrived on our front porch in three days. If you have multiple properties, you may be able to get more. Here's the link to get them from their residential site. http://www.duke-energy.com/freecfls/ or call (800) 943-7585 and you can either use your SSN or Account number to order up to 15 free CFLs. It takes less than a minute. You can figure out how much you would save by going to this website. Just by using these 12 free light bulbs you will save $78 dollars for the year. Not a Duke Energy customer? I have a deal for you too. 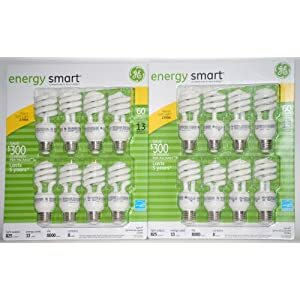 Right now on AMAZON you can get 16 GE ENERGY SMART LIGHT BULBS for $14.49 with FREE shipping if you have Amazon Prime or a $25 qualifying order. These are 13 Watt and will replace any regular 60 Watt bulb. I can’t pass up CFL light bulbs for 90¢ each!